If you’re the kind of person who gets sick of looking at the same old thing every day—including your computer interface—then Flavours 1.0.12, a program that lets you apply, create, and share creative Mac OS X themes, will get your blood pumping. 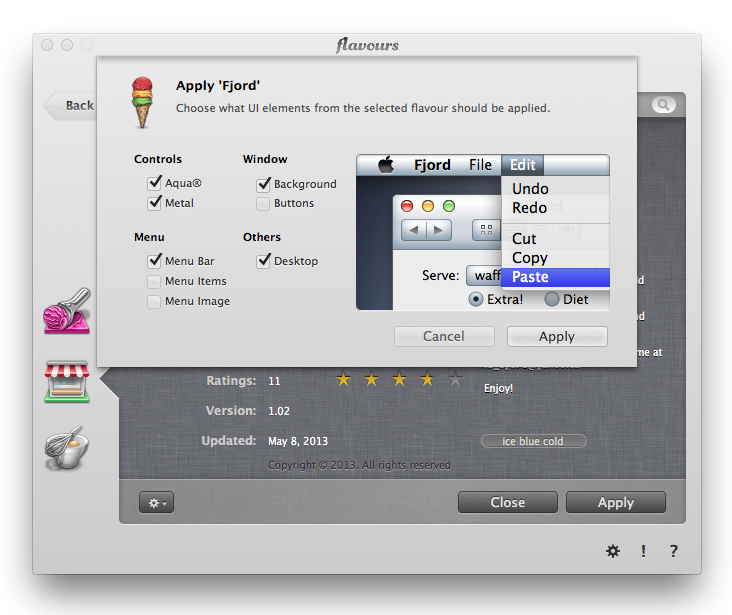 Flavours (yes, European spelling) is no ordinary icon enhancer. It is a full-on theme replacer that opens to a gallery and online repository where you can both download and publish your own original themes. The app does not modify your icons; it layers themes on menus, controls, windows, desktops, and buttons. You can survey available themes in groups such as Top Rated, Most Popular, and Latest, and the main window lets you sample interface changes. Right-click on a theme to get more details about it, open a new window for a Quick Look, add a favorite, create a new theme, or flag a selection as inappropriate. When you choose a flavor, you can use the program’s checkboxes to customize it. For changes to take effect, you log out and then log back in—a good precaution against accidents. Choosing from available themes is only half the fun. 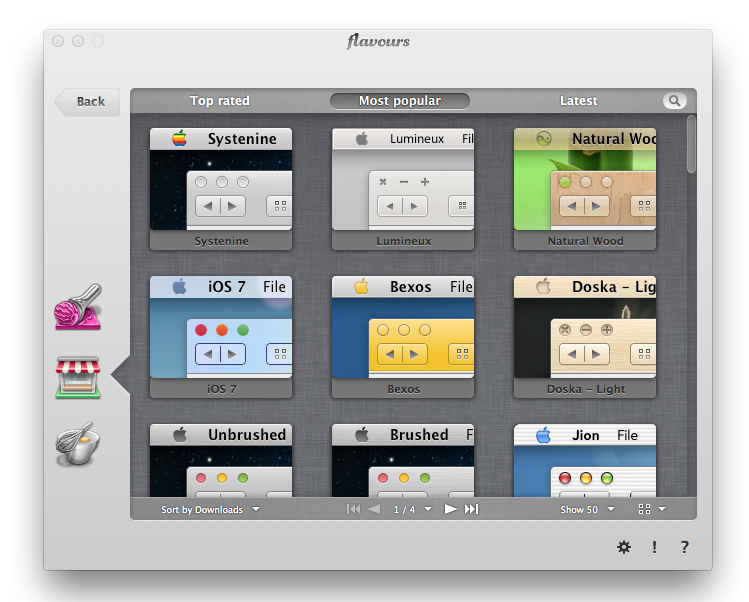 Flavours also lets you create your own themes—using existing themes as templates or starting from scratch. Theme creation can be challenging, as there are many decisions to make, down to the offset and blur on a window’s inner shadow. If you create something you think is worthy of sharing, the program facilitates that, too. At this writing, there’s a somewhat confusing requirement to create a Flavours Store account in addition to purchasing a software license to enable some of the program’s functions. However the developers have stated their intention to remove this requirement in upcoming versions. Flavors has lots of elegant Mac-like touches that make the app shine and I like that the finished themes don’t go too far—even though I found a few of them hard to navigate. It also would have been nice to have descriptions of all the themes, instead of only the featured ones. Flavours lets you apply, create, and share creative Mac OS X themes.